Wavy? Curly? Coily? How beautiful all these types of hair are. And you just have poker straight locks, and that’s all. What a terrible injustice, you may think. Please, don’t worry so much. Chloe knows how to hit the nail on the head when it comes to making perfect curls. Even the straightest hair will frizzle with the help of these magic devices turning any lock into a well-shaped curl. 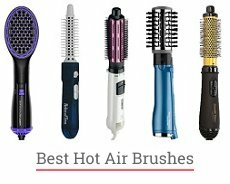 So this time we are going to speak about hair curlers, these wonderful devices able to bring us the pleasure of getting the Victoria’s Secret Angel or 80’s disco star hairstyles or whatever in-between. Hair curling is no more an excruciation as it was a few decades ago. Nowadays it’s a fast and simple process when the best innovative and specially developed devices are used. So you are going for a curly style. No matter what type of curls you prefer, Chloe is about to make the selection of the right device a little easier. Where to begin when you’ve decided to buy an automatic hair curler? The starting point, in this case, is your hair type and length. On the other side, there is an ultimate goal which is kind of curl you want to obtain. Only after deciding on these points, proceed to the final decision. Have flat or thin hair? Get yourself a curler with a smaller barrel. And vice versa, for the thicker hair. Universal size is a 1″ barrel which is as well the best option for the novice. Smaller barrels are meant to bring you springy, tight curls; larger barrels are perfect for vintage curls, looser and softer hairstyles. 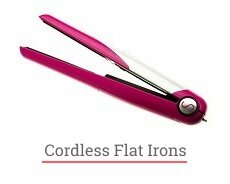 In the latest automatic hair curlers, the size of the device sometimes doesn’t even matter because the smart technologies can help you in designing various types of curls. 2 How To Curl Hair With Curlers? 3 How To Curl Your Hair Without a Curler? So what type of curl are you looking for and how to satisfy your intention? With the following TOP-10 list of curling tools, the process of selecting the new hair curler becomes a child’s play. For your convenience, I have placed my hair curler reviews in order of increasing popularity. So move further to find the name of the best Amazon hair curler according to the preferences of the majority. About ten dollars to purchase, one night in curlers, and here they are — your perfect waves. All thanks to Soft Curlers by Conair. There’s no need to describe this Conair hair curler set properties for long. 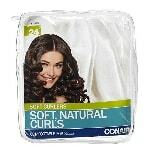 As manufacturer recommends, you can use the curlers on wet, damp, and dry hair. In all these cases, Conair Soft Curlers are going to work. They are comfortable enough to be left on the head for a whole night. And they are almost like the Sleep Styler set for $20 which is the Shark Tank hair curler recommendation. Long-lasting and bouncing curls in the morning? It’s so natural with the heatless hair curler set by Conair. With this mini hair curler set, you can get desirable waves even while travelling (without overfreighting your suitcase, most importantly). don’t work on thick hair. One more budget option for all those loving curls. This new hair curler machine by Revlon is an indispensable device for the girls craving to get the deepest and smoothest waves with ease. 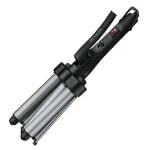 Revlon Jumbo 3 Barrel Hair Waver for Deep Waves is a perfect match for using at home. At first glance, you will notice that it looks somehow futuristic and unusual compared to other ceramic hair curler machine. However, you won’t get confused using this 3 barrel hair curler. Heat it to 420º F for the fast and long-lasting result. Don’t worry, the ceramic coating of the barrels is designed to provide less damage to your hair even on the highest temperatures. Get your perfect look simply with the uncomplicated use of this automatic Revlon hair curler. equipped with a locking ring, storage loop, and tangle-free swivel cord. not suitable for short hair. Breaking news! I’ve just found a trustworthy hair curling device for less than $40. It doesn’t burn your hair, helps create curls easily, and is equipped with tourmaline ceramic technology. Give Wave Artist Deep Waver for Beachy Waves Generation II by Bed Head a chance, and you won’t regret a minute about this purchase. If you are looking for a beach wave hair curler or the tool for distinctively sculpted curls, then this Bed Head automatic hair curler is the thing to cover both needs. Like most of the professional devices, this Bed Head magic wave hair curler has a high heat temperature up to 400°F so that you can expect to achieve long-lasting deep waves. It promises to be safe to your hair thanks to the tourmaline technology bringing shine to your hair. And some more features that are not related to the styling results. The device is equipped with an auto shut-off function for higher safety. And it has a dual voltage for worldwide use. Thus it becomes your handy and reliable hairstylist in travels all over the world. a plate-locking switch for easy storage. some consumers report that it frizzes hair. What’s the secret of perfect curls? Conair reveals the mystery with its Curl Secret Hair Styler for creating loose, medium, and tight curls on any hair type and length. “Hair goes in, and curl comes out”, assures the manufacturer. Sounds too good to be true: achieve any curl you wish with every hair type. Does this device really do the trick? Yes, it does. This Conair hair curler is well-thought out in terms of performance. It provides the tourmaline ceramic technology to reduce frizz and add shine. The device is equipped with a professional motor for maintaining two heat levels. With the range of temperatures up to 400°F, you can make your hairstyle long-lasting with ease. Use a timer for 8, 10 or 12 seconds to avoid overheating. To get safe, diversified curling with Infiniti PRO hair curler, all you need to do is to draw a lock into a chamber, then get it out after a timer signal. Voila, the tight, long-lasting curl (or a loose like Victoria’s Secret one) is ready to rock the world. suitable for making all kinds of locks. not a good choice for long hair. 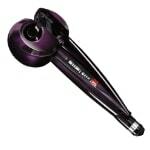 Kiss rotating hair curler by the name Ceramic Instawave 1” Automatic is not a conventional tool for hair curling. If you are tired of standard irons and wands, get this patented Curl Dial which acts as a comb for detangling hair as it curls. This Kiss hair curler, as you can read in the title, is equipped with ceramic ionic technology to deliver healthy, shiny, salon-looking curls. Decide between two heat settings with the highest up to 420º F.
Salon approach to curling is enhanced with cool additional features of the Kiss spinning hair curler. For example, the 2 years limited warranty which guarantees you a long-term reliable use. The auto shut-off function after 90 minutes of use is another advantage of this professional hair curler. you can control the direction of curls by rotating for both inner and outer-facing curls. This TYME hair straightener and curler 2 in 1 is the luxurious device every girl would like to possess. The first thing you notice is its girlish rose-gold design. And only after, you pay attention to the price (that is rather high) and properties (which are trying to justify the expensiveness). To know more about the features, read our TYME 2 in 1 hair straightener and curler detailed review. So why should someone pay $200 for it? First of all, it is a two-in-one device so pretend you buy a hair curler machine for $100 and a straightener for the same price. Doesn’t look like a squander anymore. 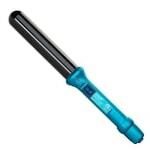 In TYME hair curler reviews, you’ll find out that the tool works great for both straightening and curling. The iron is equipped with titanium plates, warming up faster than other materials and providing the even heat distribution. 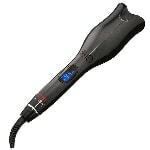 The ionic technology of the TYME Iron device takes care of your hair. With five temperature settings in-between 300° and 400° F, it is easy to choose your individual heat regime and avoid overheating. Not a bad investment after all. hair looks smooth after use. can be troublesome in making curls. When having curls is your fixed idea, only one thing can stop you from its objectification. I am talking about the condition of your hair. If it is dry, overburnt with excessive styling or weakened for some other reasons, you may not wish to worsen these troubles. But the desire of having curls won’t leave you for a minute. There’s a solution for those who want to avoid thermal impact on hair and get desired curls by all means. Curlformers Hair Curlers Spiral Curls Styling Kit is the non-heat way to get the curliest curls you’ve ever dreamed about. Just look at this no heat hair curler kit, these are not those vintage curlers you saw in the old movies or at your grandma’s head. 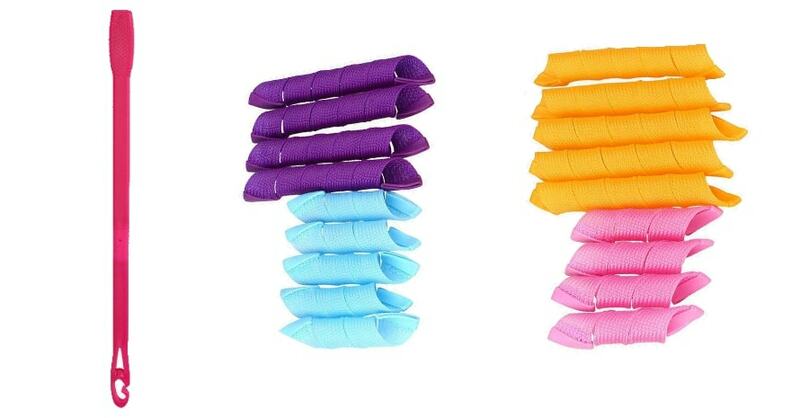 They are colorful modern accessories simple in use and perfect in achieving your curly-hair goal. The patented hair curling system is developed to bring you long-lasting and healthy-looking curls. 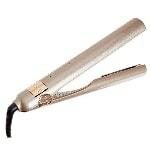 It’s a perfect alternative to heated devices for all kinds of hair especially for extra long (up to 22 inches). Twenty pink curlers for clockwise and twenty orange for anti-clockwise curls make miracles on your hair avoiding making any damage on it. curls preserve shiny and smooth look. you need more time to get curls than with heated devices. 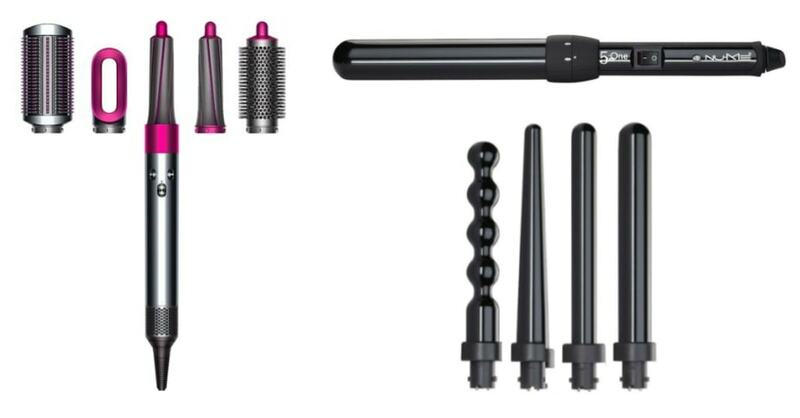 Meet NuMe Classic Curling Wand with 100% tourmaline ceramic hair curler barrel. When you look for the technological automatic device for curling hair, then here it is. What properties make this NuMe hair curler wand so unique regarding curling? 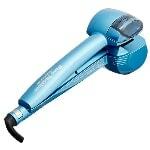 It heats to 410º F in seconds to provide the fast curling. Tourmaline ceramic technology provides negative ion conditioning leaving your hair shiny and healthy-looking. You can even use this NuMe hair curler wand for everyday styling for any hair type. Far infrared heat provides gentle even heating for maintaining healthy strands, smooth and hydrated. With advanced PTC Heating Mechanism, you can improve temperature changes in the tool. Heat-resistant styling glove makes the process of styling much more comfortable. Choose one of three available barrels of 3, 13, and 25 mm to create the right kind of curl with NuMe hair curler. salon performance available at home. CHI hair care and styling products are well-known among the female audience. And that’s no surprise because they are all meant to make your hair healthier looking and more appealing. This CHI hair curler Air Spin N Curl continues the tradition of the best brand products and helps you achieve the best-looking curly locks. Though compelled to pay rather a pricey amount, let us give a chance to this CHI hair curler device. 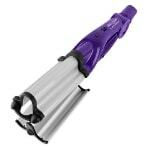 This rotating ceramic tool is probably the best hair curler machine to create styles from beachy waves to tight curls. Flawless hairstyle is achieved with merely a push of the button right after a lock is inserted into a chamber. When the tool effortlessly designs a wave, a beep signalizes you about it. With three temperature settings (low 370°F for fine hair, medium 390°F for medium hair, and high 410°F for coarse hair), there’s no need for dangerous experiments with customizing heat level. The hair damage is minimized to the edge thanks to the ceramic heat technology producing negative ions for shiny and smooth locks. This easy hair curler (or probably the easiest to use) knows its business in making all kinds of spirals on your hair. extremely easy to use even for the novice. The hottest magic wave hair curler from the hair devices world leader is on my list! Not only because of its temperature properties (it heats up to 450°F), but because of hot features as well. 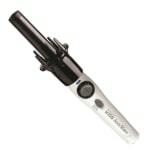 Meet BaBylissPRO Nano Titanium Professional Curl Machine that works with your hair like a professional hairstylist. All you need to check how good it is is to put a lock into a Nano Titanium chamber, gently pull, and get the result in a few seconds — silky and shiny finished curls. The manufacturer claims, you will get 20% higher curl definition, and 50% better curl formation than with other devices. The 24-hour hold is also among the BaByliss guarantees. All thanks to the SteamTech MiraCurl technology forming one perfect curl after another. Set the temperature, time, curl type and direction to decide between waves, soft swirls, defined curls, retro-chic hairstyle, and so on. 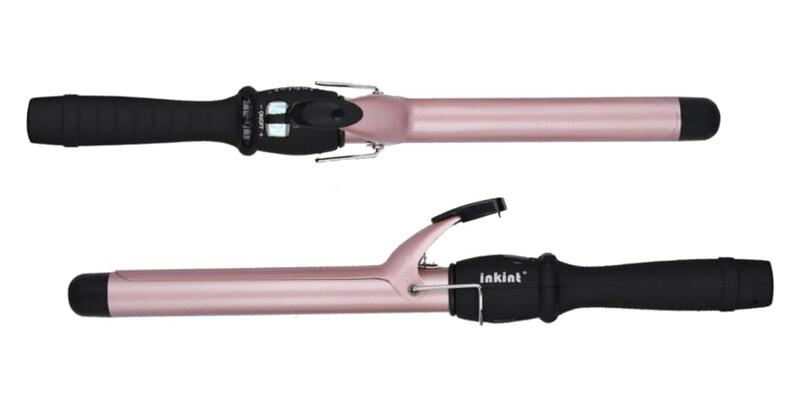 As most of the BaByliss devices, this curling machine has a well-developed professional motor. Inside of this auto hair curler, there is the MaxLife PRO brushless motor providing the precise control for all-type curls styling. This motor also promises to be a long-life assistant: it makes the BaByliss hair curler up to 25 times more longevous than other similar devices. How To Curl Hair With Curlers? So, when you finally found the best hair curler machine precisely for your needs including the type of your hair and the desired curl, another essential question arises: how to use it? Maybe the strangest tip you expect to hear is to start practicing with the curler in the off position. But believe me, it is all for your safety. 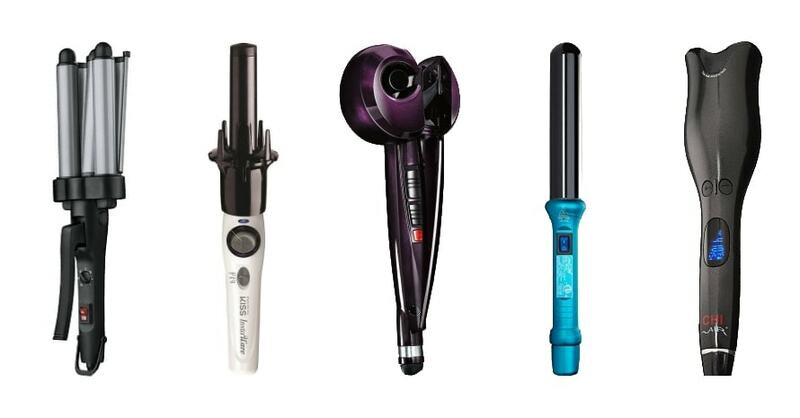 The hair styling wands and irons are devices operating with rather high temperatures. To avoid burning your scalp, skin, and the hair itself, your moves must be precise and adjusted. So to reach the best curling techniques, first work it out with the tool off. The next tip is also related to safety. This time, the protection of your hair. To prevent drying out and burning your hair, you need to protect it with thermal protectants before styling. 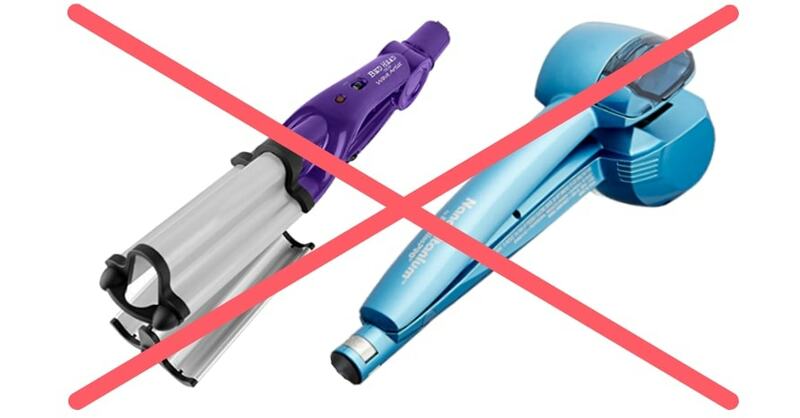 Once again, I repeat that even the best hair curler may damage your hair due to high temperatures it operates. So apply a heat protectant each time you want to make a new hairstyle and save your locks healthy as well. Find the right product considering the condition and type of your hair. By the way, such products can act like additional styling means. I also advise you to find the right temperature of styling. The majority of hairstylers suppose that 392°F is the maximum temperature to use during styling to avoid dulling and fading of your hair color. The best option for your hair is to scale down the temperature of styling and to be agile with a tool not to overexpose the hair curler machine on your strands. But we all admit that in most cases, 420°F and more is needed for long-lasting results. In such conditions, I advise you to use more heat protectant and be as nimble with your hair curler as you can. The choice of the temperature also depends on the type and condition of your hair. Thin, fine, and damaged hair suffers from heat more than thick and requires lower temperatures for styling. I think there is no need to tell that styling has to be done on dry and thoroughly brushed hair. Hope everybody remembers it? Always define your hair on small strands to achieve the best possible curl on each. Do not grab too much hair at once. The optimal time for keeping the iron on your hair is 8 to 10 seconds. Beware of damage you may cause with prolonged holding. Clip the iron closer to the roots, then twirl your hair through the clamp (if it is the curler with the clamp, of course). You can get loose and effortless waves by curling your hair while it is in a high ponytail. To get more volume, keep your curler perpendicular to the hair, for less volume hold it vertically. Watch video tutorials to find out how professionals achieve each curly style, it is beneficial. How To Curl Your Hair Without a Curler? Have no magic wave hair curler but still want to have curls? No need for an appointment at your local salon every time you want to get the curly style. Spice things up with the improvised means to get a perfect curly look. The first thing that comes to mind: if you have no curler, use a straightener. If you don’t feel ready for using a professional technique like hairstylists in salons do, you can use the simple method. Apply styling mousse on your hair, divide into strands, then twist them into bundles. Right after that use a straightener as usual on every strand you’ve separated. This technique will let you achieve beachy waves, looking natural and soft. Make yourself pigtails! This is another popular DIY hair curler practice from childhood to get the desired curly style. You can braid them on wet hair or use the styling product to help the future curls form. Depending on the size and number of pigtails, the style of curl changes. Use a sock method to get the curls. You didn’t misunderstand, you really need a sock to get gentle waves on your long hair. After washing, you’ll need to make a high ponytail, put it in the sock (cut out about two inches of it), then roll it like a donut, and simultaneously include more hair in it. Gorgeous natural waves waiting for you after a night of sleep with the sock on your head. There are even more ways to get your hair curled without heating. Hope, you’ll find your favorite DIY hair curler method and share your secret of how to curl hair without a curler in the comments. We, girls, are never sure about what we really want and how to get it. But what is common for all of us, we usually want it now and by any means (place anything instead of it, and you’ll be convinced I am right). One day we want to rock the world with beach waves, the next day tight curls become our objective. And to achieve the needed curly style, we are ready to get up earlier, experiment more with cosmetics and tools, and undergo various hardships. But you need to know, the days of suffering are gone. Making curls is not a headache anymore. With modern curling tools, you can easily achieve your perfectly-looking hairstyle. So you get a dozen of the best automatic hair curler reviews from Chloe. I wanted to help you find the best hair curler machine right up your alley. Hope, it was a useful article. And hope, you are not afraid of hair curlers anymore. They are not as difficult to handle as you thought they could be. With all these recommendations, hair curling becomes a piece of cake. Maybe you also have some tips to share with all those who dream of curls? It will be cool if every one of you shares your personal curling experience in the comments. Glad to read it! Thank you!